Image: Commuting times via hyperlanes have increased significantly - it's now common to see heavy build-ups of space traffic around hyperlane entrances and exits. New figures from the Galactic Fact Office (GtFO) show that almost 35.6 trillion galactic workers have had their daily commute extended by at least four years. The survey of 1.8 million commuters was commissioned in the wake of the galaxy's universal switch to hyperlane transport last week. 98% of commuters are now using hyperlane transport, compared to 45% before, with the remainder using isolated forms of natural wormholes (1%), artificial gateways (0.7%) or jump drives (0.3%). "This has been a direct result of the galaxy switching to hyperlanes, although the problem does not lie with the hyperlanes themselves. This is actually caused by new traffic restrictions on ships traveling within systems at sub-light speeds. We can't ignore this - while four yearly commutes are perfectly feasible in the short term, over time it may start affecting commuters' well-being, and will probably even have an impact on work efficiency too." Image: Snur Nursur wants the Galactic UN to ease sub-light speed restrictions. Lengthier commutes are now becoming an accepted part of many xenos' routines. "I live on Urseni Prime, but I visit several power plants across our core worlds. Before I could commute with ease, but now I spend at least 3 years a day travelling by hyperlane. It's a mild inconvenience." Image: Xirk Zenmar works at power plants or something. Presumably, however, he spends the majority of his time being really cute and adorable. Other commuters are going to great lengths to avoid long journeys. "I'm often sent on far-flung projects to the outer reaches of the galaxy. My commute can take a whole lifetime, and sometimes before I even get to my destination I'll get called back to my homeworld to investigate something inane. I've found the easiest way to get round this is to simply dismantle my science ship, and somehow I auto-teleport back to Blorg Prime. I'm really not sure how this process works, but it's great and I can't fathom why it's not been introduced everywhere." Image: Jane Smith, a gross fungoid, talks about some gross fungoid issue. The Galactic UN has yet to comment on the survey from the GtFO. Image: The Galactic UN has begun distributing leaflets in preparation for the universal switch to hyperlanes. The Galactic UN has issued a bulletin reminding the stellar expanse that 'Hyperlane Switch Day' on February 22nd is approaching. The date is when the galaxy is set to formally adopt hyperlanes as the primary mode of interstellar transport, and is expected to trigger major upheaval as empires reconsider how they view transit, political influence and warfare. "We are no longer the transit envy of the multiverse. Over time, the number of empires, ships and fleets in our galaxy has expanded exponentially, but transport options have not. Hyperlane routes are clogged. Wormhole stations are in disrepair. Warp drives are contributing to galactic warming. And we couldn't invest in any of them properly as our resources were being split among all of them. We needed to do something radical to solve our transport woes. Our first idea - planet destroying superweapons - was stolen by the Galactic Security Council, so our next plan was to pick one form of transport and just dump all of our resources into it." As per the Galactic UN's 3,477-page report on interstellar transport, 'So You've Got Nothing Else to Read', hyperlanes were chosen as they offered speedy point-to-point access, energy-free maintenance and natural chokeholds giving perfect locations to build space-tolls. Warp drives were also seriously considered for universal adoption, but discounted after the Public Institute for Space Health (PISH) discovered compelling evidence that prolonged use can lead to long term health problems, including Genital Warps in organic species, and data corruption in synthetics. Artificial wormhole stations will be dismantled, although pre-existing natural wormhole routes will remain operational. Other more advanced forms of transport, including Jump Drives and Psi-Drives, will remain available to technologically advanced nations, but use will now be taxed directly to the Galactic UN's Department of Licensing for Conveyance (DLC). The Galactic UN were unable to be reached to give a comment on the situation. We think. We didn’t try. > More accurate reporting from Siitharian Collective Drone 96 could not be possible. > More accurate editing from Ashley Easterbrook could not be possible. 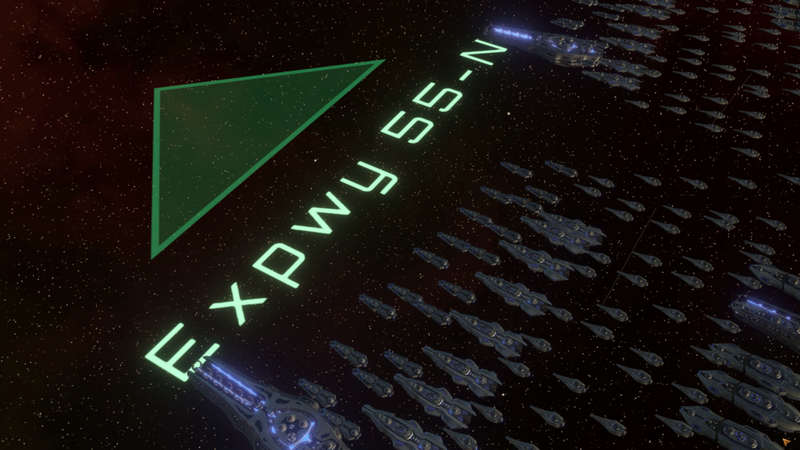 Interstellar traffic between UNE core worlds faces major disruption this weekend following closure of eastbound and westbound hyperlanes between Sol and Alpha Centauri as construction work begins on a new hyperlane expressway. The project, approved in 2245, aims to improve lengthy commute times between the planets of Earth (Sol) and Horizon (Alpha Centauri) by completely demolishing Barnard's Star, a system which straddles the route and prevents direct travel. The improvements are the latest in a series of 500 trillion credit infrastructure investments aimed at cementing Earth's rising status as a center of galactic commerce and corruption. Barnard's Star is largely undeveloped owing to a lack of exploitable resources, and consists primarily of service space-stations, space-motels and a park-and-ride with capacity for 3 billion corvettes. It is notorious for interstellar traffic congestion, and is consistently ranked as the UNE's most polluted system. Xenophilic conservationists have reacted angrily to the plans, warning construction would ruin important wildlife habitats for ancient mining drones and potentially disrupt pollution of 'historical significance'. The Department for Galactic Transport (DfGT) has advised that a full environmental analysis has been undertaken, but the results were immediately scrapped at the prospect of 38 minutes being shaved off peak commute times. The construction is expected to take 35,000 years, with diversions via Procyon in place. The DfGT will also provide extra capacity on local wormhole stations to help ease congestion. > More accurate reporting from Ashley Easterbrook could not be possible.